The order under which Elephants are classified is the Proboscidea. This is for one of the elephant's most interesting physical features. It is something that attracts curiosity from around the world for elephants along with many other aspects in the past only ascribed to the human, such as, rudimentary tool use, complex social behaviours, and reverence for a dead family member or friend. It is their trunk or proboscis; the meaning of Proboscidea species is simply animals with trunks/proboscis. Henry F. Osborn identified some 352 proboscidean species and subspecies of which only half are recognized and valid today (Elephants: the animal and its ivory in African culture). About 50-60 million years ago, the ancestors of the modern elephant occupied a variety of extreme environments; this includes from tropical rain forests to deserts in both low and high altitudes. Incredibly, with the exception of Australia and Antarctica, the proboscideans have over time inhabited every single continent on Earth. Why did all but two become extinct? One possible explanation for their disappearance may be found in the inability of the order to evolve to environmental change fast enough. One of the determining factors in this is the more specialized a particular genus of animals, then the more likely they they will become extinct in periods of dramatic climate and environmental change. Both of the surviving African and Asian elephants have a wide range of attributes which give them the ability to survive and to even thrive in mild to extreme environmental conditions. Obviously, this is probably not the only reason for the disappearance of most of the order, but serves as a good generalization for a reason why the multiple families of the order disappeared over time. The family Elephantidae is the root from which the mammoth, Asian elephant, and African elephant came from. Interestingly, the Asian elephant is more closely related to the extinct mammoth than to the African elephant. The following categories apply to the tree in which the elephant has been placed. It is part of the Animalia kingdom, Chordata phylum, Vertebrata subphylum, Mammalia class, and Proboscidea order. It is believed that 50-60 million years ago, mammals approximately the size of current day pigs, were the roots from which the proboscideans evolved from. Interestingly, based on both morphological and biochemical evidence, it is agreed that the manatees, dugongs, and hyraxes are the closest living relatives of the today's elephants. It is incredible to believe given the vastly different sizes, external appearance and the fact that they occupy completely different habitats. The following film was taken on The Cape Point, In South Africa. 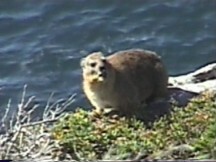 It is a brief clip of the rock hyrax or dassie of the order Hyracoidea eating on the side of a cliff that drops some 200 feet to the sea. As mentioned, this is the closest living relative to the elephant that is still in existence. The earliest known member of the Proboscidea order are the Moeritheres. They are a pig sized creature that lived in northern Africa between 55 and 60 million years ago. A little later the Palaeomastodons, who existed between 40 to 25 million years ago. branched off and were the first know descendants of the lineage that let to the two present day species of elephants. Interestingly, the mammoth, Asian elephant, and African elephant originated in Africa. It was only the African elephant that ended up staying and evolving to the animal we know today solely in Africa. The mammoth became extinct as recently as 5000 years ago; fossil records indicate that the hunting by Man was a factor in eliminating the mammoth, as well as global warming.